I bought this satchel to accompany me during research in West Africa, and it easily proved to be the best piece of equipment I brought with me. The bag continues to stand up to daily wear in humid, tropical conditions. Note that the version sold by Indy includes all the interior pockets and compartments of the original Mark VII. For me, this has been great, as the bag easily accommodates a field journal, a camera, a voice recorder, my house keys, and several other odds and ends, all conveniently organized into separate pouches. After about eight months of constant, daily use, one of the cloth loops that the O-rings pass through started to come unstitched, but a local tailor was able to get it back in working order pretty easily. 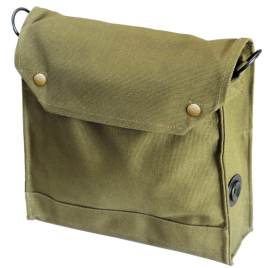 In sum, this is a tough, smart-looking satchel. You won't be disappointed.